Administrators and user managers can use the Groups page to view and export group data, including the projects the group is a member of and the users who are part of the group. Navigate to Admin > Groups. Click Export CSV at the top of the groups list. Wait for the report to complete and save the file when prompted. 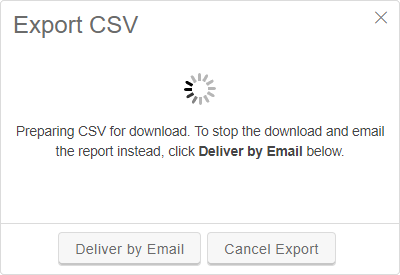 Or, if you don’t want to wait for the report to compile, click Deliver by Email. The report is generated offline, and then a link to the report is emailed to the address associated with your user account. Group ID A unique identifier for the group. Name The display name of the group. Description The description for the group. URL The URL for the group page. Projects A list of the projects that the group belongs to. Users The users who are members of the group.